HomeGuest WriterIs there a Manchester United youth strategy? I have worked in multi-national organisations, and specifically Human Resources for over thirty years and in my role as a consultant I help businesses with performance and talent management systems. Organisations have thousands of employees and they are trying to maximise performance from each one, attract new talent into the business while rewarding and retaining their top performers. Each employee is assessed and measured in three critical areas…current performance, current behaviours/motivation and finally future potential. Often there is difficulty with assessing these areas as it’s virtually impossible to watch someone’s performance closely every day they come to work. As a consequence, a range of tactics and mechanisms are employed to help. These assessments are then integrated into a ‘talent map’ and strategies are developed for certain key groups but more importantly for each individual. For those employees who are deemed to be ‘high potential’, the development plans could include a range of different activities ranging from additional training, coaching/mentoring, job placements, lateral role movements, secondments and so on. Each employee has ongoing discussions with their manager about their career and it’s very transparent. People move around the organisation in a very proactive, planned methodology. When you are planning for development there are two key elements to consider. So what has this to do with football and specifically Manchester United? I was working from home last Friday and was taking an interest in the transfers on ‘deadline day’, when it seemed that every new bulletin or update was referring to a Manchester United youth player going out on loan somewhere. In the end, twelve players moved out of the club on either loan or permanent deals… an unprecedented ‘development plan’ in the history of our club. Now, for the players concerned, it is probably a good thing. Many are not getting regular football, one or two are stagnating in the U/21’s while others probably don’t have a future at the club. So moving them on for various reasons makes sense, but exactly how much mid to long-term planning was in place is questionable. For the life of me I just couldn’t see the strategy. It appeared incredibly reactive. 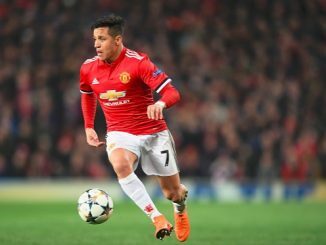 So I reflected on the current infrastructure and the development plans that may exist for each Manchester United footballer and thought I would share them with you. Let’s look at the infrastructure first although they are both clearly linked. Infrastructure in footballing terms would include things like the training environment (both physical and emotional), the facilities, the kit, pitches, coaching staff, latest technology, an effective league system, ample playing time and of course a positive developmental culture. United have come a long way since the days of The Cliff and without any doubt many of the above areas would receive a big positive tick. However, in the areas of effective league system and ample playing time I think there are major issues. There are simply not enough games for players. 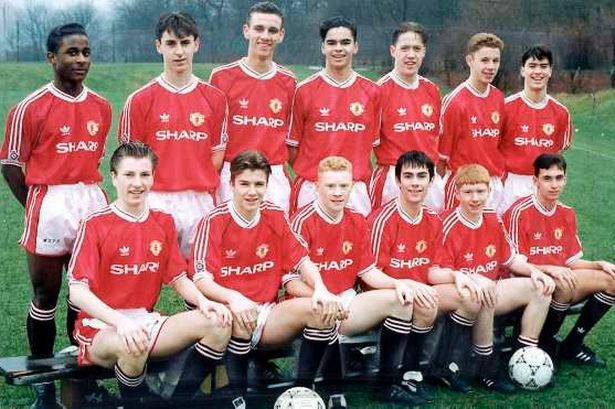 Up until the late 1990’s, with a smaller playing squad, United competed in four separate leagues. Regardless of age or experience you could get a competitive game of football every week. Today, there are over 60 professionals on the clubs books with only two leagues to play in. So you have doubled the squad size and halved the playing opportunity. In addition, the number of friendly matches contested throughout the season has also reduced by up to 70% giving players even less playing time. The mathematics just don’t add up. In business terms, you wouldn’t hire employees and then give them nothing to do. You either expand the business to find opportunities (extend the infrastructure) or downsize. Back in 2005 we entered a second reserve league… the Pontins Reserve League West facing the likes of Rochdale, Burnley, Blackpool and others…giving some of our more experienced juniors a chance of ‘mixing it’ with the second string of league clubs. Our younger lads also played in the FA Premier Reserve League North. That seemed a logical step but only lasted for one season. I have no idea why. The Football League and FA have created an infrastructure (U/21 league and U/18 Academy) with limited flexibility and although technically the players are superior to their 1970 equivalents, there appears to be a limited challenge in many of these games. It’s just not competitive. So what is the consequence? Let’s take last seasons U/18 Academy captain Liam Grimshaw as an example. Now too old for Academy level football, Grimshaw has only played five competitive matches in the first six months of this campaign… including the UEFA Youth League that’s less than one game per month! Too inexperienced for the first team, with too many players ahead of him in the U/21’s, how can he develop if he isn’t playing? Regardless of the experiment in 2005, there doesn’t appear to be any movement to enter additional leagues whatsoever so I assume the club has dropped that option all together. As a consequence, we seem to rely on the loan system as part of the strategy to minimise the impact of an ineffective league set-up to get players match practice… but are we using it to optimal effect? United have been loaning junior players out since the early 1970’s so the practice is nothing new although it was still a relatively rare occurrence back then. However, by the end of October 2013 only seven current professionals had been sent on long- term loans – Tunnicliffe, Vermijl, Henriquez, Bebe, Petrucci, Powell and Macheda – and frustratingly for Grimshaw, not one of those players was a centre-half so he still couldn’t get games. Picking the right loan club must be difficult to assess. You need to factor in the culture of the club, playing style, the manager, current squad etc etc. Too many times in the past we have sent players on loan only for them to warm the bench or worse still play in the reserves of the lower league club. Many youngsters come back expressing that it was a waste of time. So, do we have too many players on our books? What are the better clubs to use for our young players? How many are we going to send out? What are we going to do with them when they get back? It needs proper planning. It needs strategising. But what is that strategy? Which leads us on to the second question… what is the individual player development strategy? 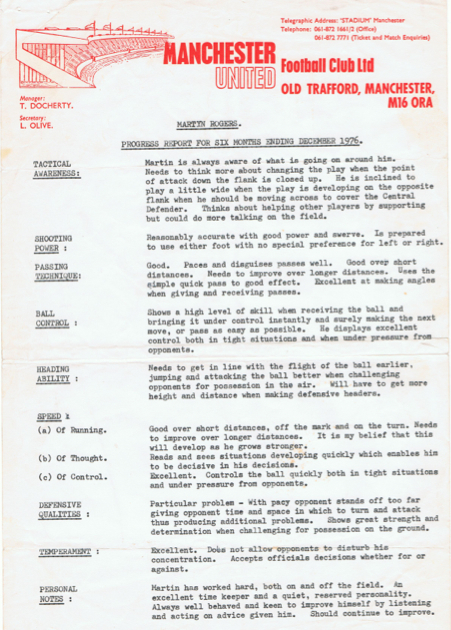 Just like in business, players performances are regularly assessed, although with footballers it is much easier to undertake that assessment as coaches watch every minute of every match, see them in training every day, they review video tape…and if they want a public opinion you can listen to the groan or cheer of 75,000 fans at Old Trafford. As far as the Reds are concerned, individual player development plans are nothing new. So even back in 1976, a strategic approach was in place for junior player development. As Martyn moved up the ranks at the club the different coaches would support his development. I’d like to think that if I walked into Carrington I’d see a huge whiteboard with all the players’ names on it and their 12-24 month development plans all mapped out. That’s what you would see in business. Maybe Charni Ekangamene’s recent move to central defence was mapped out on the whiteboard as a prelude to his going on loan to Carlisle United and Liam Grimshaw knew all about it. Maybe! However, when I saw the activity over the last week it makes me seriously question the planning going on at the club. Clearly nothing was in the pipeline for Ryan Tunnicliffe except an extension of his loan at Portman Road. Then in the final hours of last Friday he suddenly signed a permanent deal for Fulham FC. Perhaps the club were trying to sell Ryan for some time and no offers were forthcoming until the late bid from the Cottagers. In this case perhaps the lack of planning was the fault of Fulham and not United. Either way, I hope we haven’t annoyed Ipswich Town as it seems finding a good loan club is difficult. Ok, let’s take Federico Macheda. After bursting into the limelight with his goal against Aston Villa in 2009, he has been on loan at Sampdoria, Queens Park Rangers, Stuttgart and Doncaster Rovers. His career seems to falling quicker than United’s share price. Maybe once again, it’s not anything to do with United but poor planning at all these others clubs in three different countries? Then there’s Davide Petrucci, who, after a terrible run of bad luck with injuries was finally given a loan at Peterborough United in 2013 and played well for the Championship side until he picked up yet another knock which sidelined him. Maybe not good enough for the top level with United but very capable at the next level down. In September 2013 he was sent out on loan again, this time to Antwerp in the Belgian Second Division. Once again perhaps, there were no clubs in this country interested in having a decent ball player in their squad and Antwerp was the only option available. He is now back in our U/21’s as an overage player. What next for Davide? Finally let’s look at the example of Tom Thorpe. Another member of the 2011 FA Youth Cup winning side, Tom has been outstanding at all levels. But like many talented youngsters in that group, it almost seems that we don’t know what to do with them and one by one they leave the club…could we have done more? The club moved Tom through the system and gave him development time in the U/21’s in midfield. Maybe that was part of his tactical development. Then for most of the 2012/13 season, and all of this to date, a full 18 months, he was playing again in our central defence. Luckily once again another club, this time Birmingham City, asked about his availability late last Friday and he has gone to the Midlands until the end of the campaign along with Tyler Blackett and… oh yes… Federico Macheda. None of these deals were rumoured or discussed weeks in advance but came right out of nowhere and were surprising to supporters everywhere. Clearly I don’t believe that all these ‘other’ clubs have a monopoly on reactive player management and a club of our history, culture and reputation of youth development should be leading the way with innovative practices. Unfortunately I don’t see it as a recent trend. The development of David Jones, Giuseppe Rossi, Gerard Pique and Robbie Brady from the Reserves to first team seemed unstructured at the time, while the likes of Magnus Eikrem surprisingly didn’t get a sniff at all. Finally, while personally I think there were other factors at play, many United supporters will point to Ravel Morrison and Paul Pogba as typical cases in point. I’m not a football coach and I certainly don’t profess to know the intimate details of the youth policy at the club. However, policies should be obvious by the nature of the behaviours of the people managing the youth system. I hope that the likes of Jesse Lingard, Andreas Pereira, Ben Pearson, Joe Rothwell and others have clear development conversations and plans in place. I hope that David Moyes has taken his time to look at the youth set up over the last six months and realised that things need changing at this level too. I hope that Manchester United would be at the forefront of ‘talent mapping’ just the like the leading edge multi-national organisations out there. I hope in coming years that we still have the best youth system in the country and one of the best in the world. Currently there are over 100 former youth players on professional terms with clubs around the globe. I hope that United re-establish themselves as the pioneers of youth development like we did with the MUJACs in 1938, the Busby Babes going to Zurich in 1954 and Nike Premier Cup in more recent times. I hope that the many players who fail to make the grade at United still continue to find a career in the game. I hope that the decision to loan 14 players out in the January window WAS a reactive approach…but it was a strategic reaction. 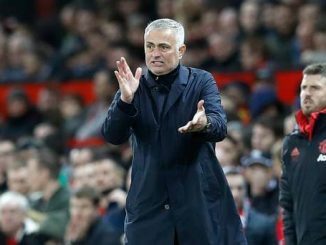 4 Comments on Is there a Manchester United youth strategy? Good piece, but I see more positives than is portrayed here. The stagnant nature of the class of ’11 has to be corrected for the younger ones coming up. The talent lost could be collateral damage, but it might be worth it. Having more u18s as regulars at u21 level will surely help with game time, competitive experience (to some extent) while giving the coaches a chance at first hand assessment of player progress. Pearson, janko, pereira and wilson, just to name my stand out players, will develop quicker under such circumstances. At least I hope so…. Very thoughtful piece Tony; your experience in the corporate world and ability to relate it to United (your passion) in the above strategy makes for great reading. I know a lot of people are on the “Moyes out” bus at the moment but in his defence, this just shows how much work he’s got on his plate at the moment. SAF was there for so long that his knowledge of the youth and likely his strategies for the top youth and reserve players was deeply ingrained, so for DM to jump into the role and be expected to gain this knowledge quickly enough to make thoughtful decisions on loans is nigh on impossible, especially if it’s to be considered that his main goal is to deal with a 1st team that are expected to compete for 4 trophies each season. Sir Alex’s knowledge is not easily or quickly transferred. I’ve read an interesting piece on Moyes’ “whiteboard room” in which he had exhaustive planning of his Everton team’s development and recruitment strategies, and no doubt he’ll implement something similar at United but right now I’m sure he’s got too much on his plate; when he’s not coaching the 1st team he’s scouting Europe for much-needed new signings. It makes sense then that he likely just used the mass loaning as a way of thinning out the Reserve and U18 squad, with the hopeful outcome that some players on loan will come good and be able to squeeze their way into the 1st team squad next season; with the balance falling by the wayside in his thoughts. It should also be noted that Chelsea seem to have used their loan strategy to great effect in recent years – with exceptional young talent (who are not quite ready for the Chelsea 1st team) being able to complete effectively in other leagues throughout Europe. Perhaps we could take a note out of their book? Here are a few thoughts . . . The log jam within the U21 team/squad is frequently caused by returning loanees such as Bebe, Macheda etc., who seem to always get an automatic start despite their lack of form and team ethic. The team we put out against Boro was at sixes and sevens most of the time and played like strangers. What is happening with Nick Powell ? Surely he should be in the United first team squad for the rest of this season, instead of being sidelined at Wigan. I enjoyed the article. Maybe you should consult with United to give them a corporate spin on their Youth development strategies?! From the outside, not seeing players up close and personal it is hard to judge why certain players who seem talented on the tube aren’t deemed good enough. 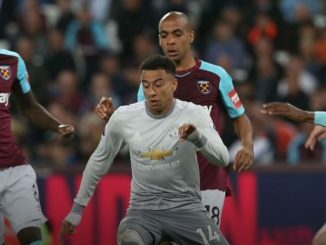 It is difficult to wonder why the likes of Lingard are not even considered for cameos. We have a lot of dead weight in the first team squad. I would rather the likes of Lingard and Powell would be squad players who actually get game time than others. Considering we were in 4 competitions to start the season i think it was a bit short sighted to not included some more promising youngsters (not named Januzaj) in the squads.